For “Row” means one of many lines that make up the vineyards. Do you remember all those long and disciplined rows, positioned an equal distance, what you see when passes next to a vineyard? Each of them is, in fact, a row. The vineyards of La Casa Vecchia is located in Valdobbiadene, hilly area in the North East of Italy, more precisely in the Cartizze area in Santo Stefano of Valdobbiadene. In 2009, the Ministry of Agriculture, ranks this area as Denomination of Controlled Origin and Guaranteed (DOCG), highest quality Italian. What is Adopt a row? The farm La Casa Vecchia offers the opportunity to take a row, give his name to a set of screws, precious charged clusters that in late summer will become an excellent sparkling wine. The adoption of row tough a year and can be renewed in time. Once adopted the row, is a plaque with your name right at the beginning of the row itself. You can take part to all the work in the vineyards: from pruning to ligation, from harvesting to winemaking. Once produced the wine, you can customize the label of your bottle, keep the wine for you, or give it to whoever you want. What adopters of a row receive? discount on the purchase of other products La Casa Vecchia. 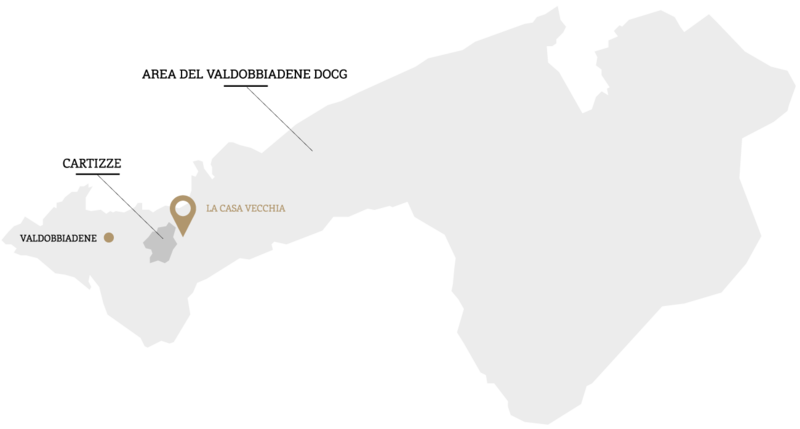 Where are the vineyards of La Casa Vecchia? The vineyards of La Casa Vecchia is located in Valdobbiadene, Veneto. More precisely, the area where our vineyards are located is that of Cartizze, in Santo Stefano of Valdobbiadene. An area famous and renowned for excellent sparkling wine production. What are you waiting for? Adopt a row!